Imagine you and…a crowd of swingin' sixties fans taking a stroll down memory singin' so happy together? And yet this is not just in your imagination, it's a real throwback moment where everyone is guaranteed to be "Happy Together" ! 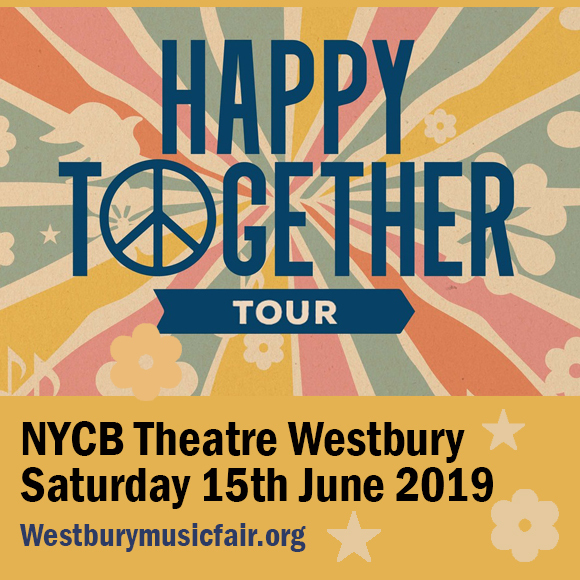 Indeed, this all-star, all-iconic line-up of six legendary artists will come together for this monumental tour at the NYCB Theatre at Westbury on Saturday 15th June 2019. THE TURTLES, CHUCK NEGRON formerly of Three Dog Night, GARY PUCKETT AND THE UNION GAP, THE BUCKINGHAMS, THE CLASSICS IV, and THE COWSILLS — will truly bring on one big sing-along party as they dish out hit-after-hit-after-hit! Every ticket becomes a truly priceless experience. Signs of high demand for tickets are imminent. Plan ahead and don't wait 'til the last minute. Get your tickets now! Here's a definitive celebration of retro music that will make people come and feel "Happy Together"! Yes, this is a tour de force, a dream team that would take you back in time to relive all your throwback moments. THE TURTLES, CHUCK NEGRON formerly of Three Dog Night, GARY PUCKETT AND THE UNION GAP, THE BUCKINGHAMS, THE CLASSICS IV, and THE COWSILLS — these legendary acts will sing the soundtracks of your lives as your mind goes on flashback mode to those wonderful memories of yesteryears. The Turtles is the band behind the banner song "Happy Together", considered one of best songs that represent the swinging make-love-not-war sixties vibe. Chuck Negron is one-third of the band Three Dog Night. They scored several chart-toppers which include "Mama Told Me (Not To Come)," "Joy To The World," "Black & White," and "Old Fashioned Love Song." Gary Puckett & the Union Gap sired six Billboard Top 200 albums which include the hits: "Young Girl," "Woman, Woman," and "Incredible." "Indian Lake," and "The Rain, the Park, and Other Things" are the biggest hits of The Cowsills; while Mark Lindsay has"Arizona" and "Silver Bird." The Sponsor Davis Group are the certified hitmakers of "I'm a Man" and "Gimme Some Lovin'". Celebrate music at its finest moment. Unlock a treasure trove of oldies but goodies with "Happy Together". Book your tickets now!